Brussels, Oct 14 (IANS) European Union (EU) leaders have voiced their commitment to the Iran nuclear deal and its full implementation by all sides, despite US President Donald Trump’s decision to decertify Iran’s compliance with the deal. The leaders of France, Germany and Britain, in a joint statement issued by 10 Downing Street on Friday, said they were concerned by the possible implications of Trump’s decision, urging the US Administration and Congress to consider the implications to the security of the US and its allies “before taking any steps that might undermine the JCPoA, such as re-imposing sanctions on Iran lifted under the agreement”, Xinhua news agency reported. The Iran nuclear deal, formally known as the Joint Comprehensive Plan of Action (JCPoA), was the culmination of 13 years of diplomacy and was “a major step” towards ensuring that Iran’s nuclear programme is not diverted for military purposes, the statement stressed. Noting that the JCPoA was unanimously endorsed by the UN Security Council in Resolution 2231, the leaders of the EU trio said the International Atomic Energy Agency “has repeatedly confirmed Iran’s compliance with the JCPoA” through its long-term verification and monitoring program. “Our governments are committed to ensuring the JCPoA is maintained,” the joint statement said. “We stand ready to take further appropriate measures to address these issues in close cooperation with the US and all relevant partners. We look to Iran to engage in constructive dialogue to stop de-stabilising actions and work towards negotiated solutions,” they added in the statement. Following Trump’s announcement that he had decided not to certify Iran’s compliance with the landmark deal, EU foreign policy chief Federica Mogherini said the EU will continue to fully implement the Iran nuclear deal. “It’s not a bilateral agreement. It does not belong to any single country. It’s not up to any single country to terminate it,” said Mogherini at a press conference. “We cannot afford… to dismantle a nuclear agreement this is working and delivering,” she said, stressing the IAEA has verified eight times that Iran is implementing all its nuclear-related commitments. “The US’ domestic process — and I underline domestic — following today’s announcement of President Trump is now in the hands of the United States’ Congress. The JCPOA is not a domestic issue but a United Nations Security Council Resolution,” the EU Foreign Policy chief stressed. “The European Union continues to fully support the Iran nuclear deal, and the full and strict implementation of all its provisions by all parties,” said Mogherini. The Iran nuclear deal, or the JCPOA, was reached in 2015 between Iran and Britain, China, France, Russia and the United States plus Germany. The EU also played an important role in brokering the deal and deemed it as one of the bloc’s outstanding diplomatic achievements. Trump announced on Friday that he had decided to decertify Iran’s compliance with the landmark deal. 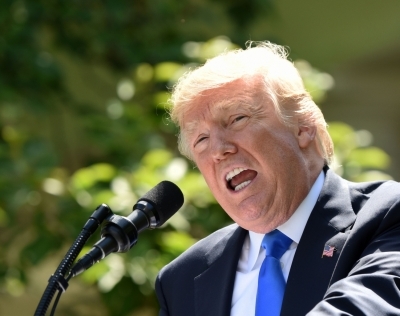 “I am announcing today that we cannot and will not make this certification,” Trump said at the White House as he unveiled a new Iran strategy of his administration. Instead, he said he was directing his administration to work with Congress and US allies to address “the deal’s many serious flaws,” including “insufficient enforcement and near-total silence on Iran’s missile programs”. In case the efforts fail, Trump warned that “then the (Iran nuclear) agreement will be terminated”. The decertification would not pull the United States out of the Iran nuclear deal at the moment, but it would open a 60-day window in which US Congress could reimpose nuclear-related sanctions on Iran, a step which would mean the violation of the deal on the US side.